It has been a relatively quiet and uneventful week. Andrew worked monday, wednesday and friday so Perry and I spent a lot of time just hanging around the house. I finally got some work (real work) done that I have been desperately needing to start on. For some crazy reason I agreed to help write a nursing textbook chapter while on maternity leave...it is a great opportunity...just terrible timing. I am not going to lie...it has been a hard week for this mommy. Maybe it's a growth spurt because for the larger part of the week he was waking up from his daytime naps crying and hungry (i think) every 1.5-2 hours when he was previously doing awesome on a 3 hour schedule. This hinders my ability to get out much when he is eating like a barracuda all day. The weather was nice several days this week so we got to get out a little and take walks in the neighborhood which was nice. Perry loves to ride around in his stroller. Aunt T came to visit wednesday and we got out for lunch. 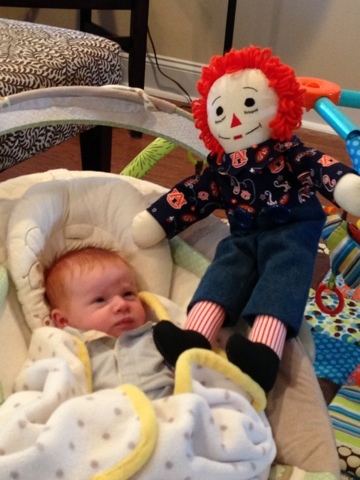 She brought Perry an awesome auburn Raggedy Andy that she had made. Raggedy has a special place in my heart for the ones Aunt T gave me when I was little and for the fact that it is my sorority's mascot. Hoping for a better and more restful week next week. No matter what though we are loving our little boy.